I love Taylor Swift, both the entertainer and the person. Yes, I genuinely, un-ironically, and shamelessly love her. I have since she broke out onto the scene as a country artist back in 2006. Reputation isn’t my favorite Taylor Swift album (hi, Fearless), but I enjoy it, as I enjoy all of her music. Is she perfect? No, but she’s entertaining as hell. So, as you read about my experience buying Reputation World Tour tickets, keep in mind that this is coming from a genuine fan, not a hater. On November 10th, Taylor Swift released reputation, her sixth studio album. And a few days later, on November 13th, she announced the first round of dates for her Reputation World Tour. Devoted fans immediately got to work in her #TaylorSwiftTix Ticketmaster Verified Fan portal, hoping to earn early access to the ticket presale. Look. I’m 29 years old. I know a marketing tactic when I see one. But a lot of Taylor Swift’s fans who participated in the #TaylorSwiftTix program are minors. Just one scroll through the Taylor Nation Twitter feed will show you that — and just how much merch they bought to earn boosts. 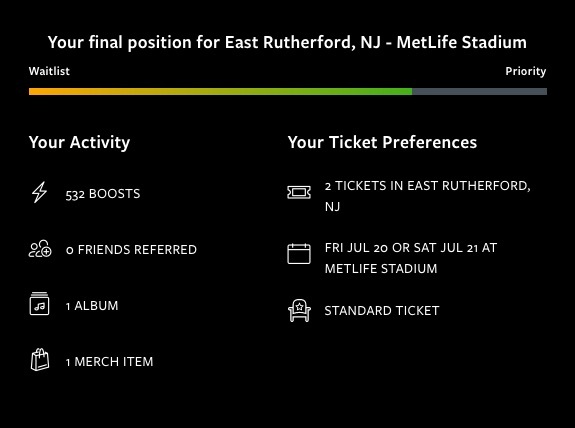 Is it ethical to game-ify an already expensive purchase like stadium concert tickets? Particularly when your core demographic is teens and young people? Some might hear Taylor saying, I’m cracking down on bots! I’m helping you! But I can’t help but hear, Do you really love me? Buy my stuff and prove it! I don’t know if it’s business savvy or manipulative marketing. Or, perhaps, a bit of both. Some fans really went for it. While I appreciate the sentiment that Taylor wants to put fans in seats, and reduce resale culture as much as possible, it’s impossible to ignore the ethics of the fine print. She’s essentially asking fans to buy her album, rep her merch, and give her YouTube video views in exchange for — yep — the chance to spend even more money on concert tickets. And yes, you read that correctly. Registering and using the #TaylorSwiftTix portal only gave fans “the opportunity to purchase tickets during the presale window,” according to another email from Taylor Nation. Nothing was guaranteed. Spoiler: I did not get this many boosts. While I did try my best to get as many boosts as possible, I didn’t go overboard. I wanted to find out how much a fan would have to do, within reason, to get Reputation World Tour tickets without spending a lot. Some days, I earned a lot of boots; others, I didn’t participate at all. (Hey, this experience coincided with Thanksgiving. Give me a break.) I repeat: I did my best. So, how good was my best? Here were the “boosts” you could earn on the Taylor Swift ticket portal. They ranged from low to medium to high. When the damage was done, I spent $33.99 and gave Taylor 511 YouTube video views — which translated to 22.57 hours of my life. This one was easy. I bought the album the day it came out, and received a nice “jump” in line because of it. I would have bought it with or without the #TaylorSwiftTix portal, so this cost didn’t bother me. This one was also easy, but I might have signed my life away in the process. The Twitter and Tumblr authorization screens asked if it would be ok for them to post on my behalf. Of course I said yes, because I’d already come this far. I figured I might as well go through with it. I already followed Taylor on some platforms, but I followed Taylor Nation, her management team, to earn all five boosts. Cost: I might have accidentally turned myself into an #ad. I never got around to this one. I said I would, but then I never did. Whoops. This is where the boosts get interesting. After buying reputation and the pin set, I leaned pretty heavily on video views to increase my ticket presale standing. Because you could just open the #TaylorSwiftTix portal, hit mute, click play, and go about your business in another browser window. I’m on the internet all day, every day, anyway, so it didn’t require a ton of effort. You could watch each video up to 10 times per day, so I did (well, tried to do) just that. I ran into some problems along the way, but more on that in a bit. Some videos made it easier to earn boosts than others. For example, this one was only 31 seconds long. Since all videos were (allegedly) weighted the same, as medium boosts, I figured it was the best place to start every day. Fun fact: A few days into the experience, I realized that the lyric video is about 40 seconds shorter than the actual music video itself. Why? Because it doesn’t include the extra bit at the end where all of the different versions of Taylor banter back and forth outside of her reputation plane. If only I’d realized it sooner. Hey, when you’re playing the #TaylorSwiftTix game, every second counts. I also didn’t do this one. Sorry. This video was by far the longest — it clocks in at over seven minutes. So when I was burning through video views, it always came last. It was a behind-the-scenes feature, plus the entire “Look What You Made Me Do” music video. So that’s why it has the least number of views. Another fairly short video that helped me get the job done. This one was just under a minute long, which made it easy to secure some video views even on busier days when I couldn’t do much else. Honestly, I didn’t want to bother anybody with my little #TaylorSwiftTix mission. And I don’t know anyone who would have actually accepted my invite anyway. Cost: I still have friends. Remember back in August when everyone was like, Why the hell is Taylor Swift’s face on the side of UPS trucks? Well, even that was integrated into the #TaylorSwiftTix portal. In exchange for a medium boost, fans were encouraged to snap a pic of a truck displaying Taylor’s face, tag UPS, and include the hashtag #TaylorSwiftDelivery. I never saw a Taylor truck out in the wild, though I suppose I could have tried using someone else’s pic. I’m not about that life though. Cost: UPS brand awareness is at an all-time high. Another easy one. I signed up for emails because it’s incredibly low-stakes, and was rewarded with a similarly weighted low boost. Since then, I’ve mostly just received emails pushing reputation merch. This one confused me. The #TaylorSwiftTix portal said I completed this one, even though I never pre-ordered reputation, just bought it on iTunes when it came out. But maybe that was good enough. Thanks for the free boost, I think? The #TaylorSwiftTix portal itself was extremely buggy. Some days, I couldn’t get any boosts to stick at all. (I bet those video views still counted on YouTube, though.) No matter how hard I tried to participate, I just couldn’t get my “standing” in the presale line to budge. There were ways to earn bonus boosts too, like interacting with Taylor Nation on Twitter. I did not earn this boost, nor did I even try to earn it. I can’t help but be skeptical if anyone actually received it. If you did, send me a screenshot! On November 28th at 12 pm eastern, the #TaylorSwiftTix portal closed. The Taylor Swift Tix portal is now closed! Check your email this Saturday for your personalized presale date and time. Here’s where I stood in the presale line at the end of it all. We had to wait four agonizing days to see if our purchases, video views, and tweets had any impact on our “Priority” status or not. The presale ran from Tuesday, December 5th through Friday, December 8th. Your assigned date would say it all. According to a Ticketmaster email, there were four tiers. Obviously, we were all hoping for a Tuesday presale date. On Saturday, December 2nd, I received my ticket purchase window: Tuesday, December 5th from 9-10 p.m. When all was said and done, with medium-to-low effort, I managed to secure a purchase window on the first day of presale. And the seats I bought aren’t too bad, either — shoutout to Section 126! Even though I wasn’t among the first to gain access to the presale, I still had tons of seat options. I also had the option to buy the Snake Pit, Big Reputation, or Kingdom Keys packages, which included incredible VIP seats and even MORE limited-edition merch. But I stuck with General Admission, because I am but a simple lady. So, was playing along with Taylor’s little games worth it? I’m not sure. I am a Taylor Swift fan, and I am excited to see her live. But I spent a total of 22.57 hours watching her videos on YouTube, you guys. That’s nearly an entire day of non-stop watching. I also spent $33.99 on boosts. And at the end of the day, I still spent $358.65 on Reputation World Tour tickets. I’m just glad I spent the majority of the money on the actual concert tickets and not the merch to help get me there. Look what you made me do, Taylor. Or did I do this to myself? Dammit. We’ll talk in July.